We’ve been following the rise of the Japanese fashion blogger known as Kyary Pamyu Pamyu (aka Carrie) since we began taking street snaps of her last year. Kyary’s rise has been fast and furious – going quickly from a high school girl blogger to promoting her own beauty products, helping raise money for earthquake relief, and starring in Harajuku fashion shows. But all of that pales in comparison to today’s big news – Kyary Pamyu Pamyu has released her first official music video (PV)! Kyary’s new video is for her debut single “PONPONPON”. The producer of the song is none other than Yasutaka Nakata of Perfume/Capsule fame. The sound is definitely in the Perfume/Capsule realm, but the presentation of the video actually reminds us more of another act that Nakata has worked with – the one-and-only MEG. If you’ve ever seen a MEG concert, you know that she goes all-in with the KAWAII, and adds a side order of bizarre. 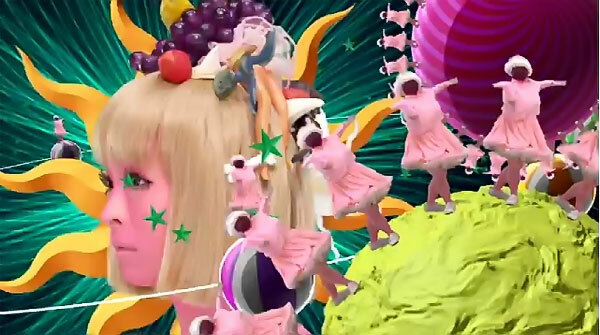 Kyary’s new video mixes and matches those two elements as well. It’s cute – it’s weird – it’s Harajuku! Speaking of Harajuku… Kyary Pamyu Pamyu is a Harajuku personality, and she’s risen to fame largely based on her Harajuku-ness. If you check out the video, you’ll see that she hasn’t forgotten her roots. The room that she’s dancing in in the video was created by none other than Harajuku’s own Sebastian Masuda of 6%DOKIDOKI. Kyary’s 6%DOKIDOKI room reminds us of one of Sebastian’s previous creations, the 6%DOKIDOKI Popples Room that we visited last year in Shibuya. 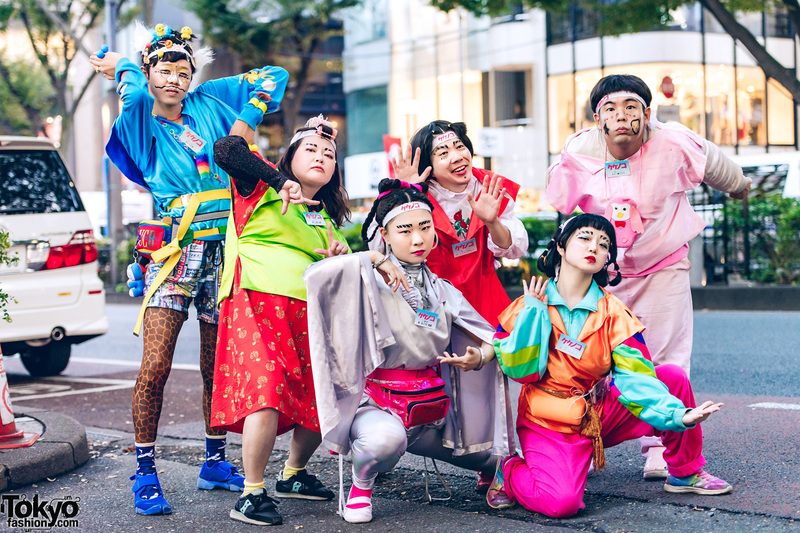 We aren’t yet sure who did the full art direction for the PONPONPON music video, but there’s quite a bit of Tokyo’s famous “kawaii” fashion going on here – from the hair bows to the pink Dr. Martens with ruffle socks to the eyeball-print bloomers (her shorts & gloves look like they may have the logo of Spinns Harajuku on them, but we’re not 100% sure). These are items we’re seeing on the street in Harajuku right now, though perhaps taken to the extreme. Anyways, enough introduction! Ladies and gentlemen, here’s Kyary Pamyu Pamyu singing “PONPONPON” just for you! PONPONPON will be featured on Kyary’s debut mini-album “Moshi Moshi Harajuku” (“Hello Harajuku”), which will be released on August 17, 2011. Until then, enjoy the video! We’ll keep you updated with more Kyary Pamyu Pamyu music news as it becomes available to us. 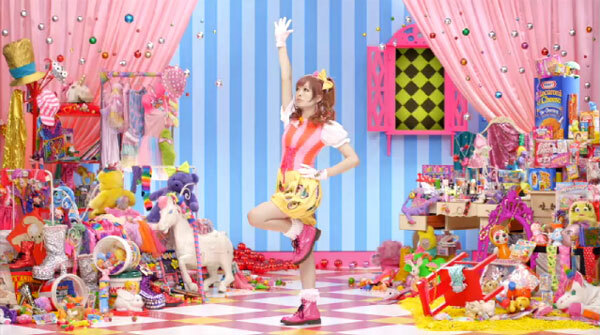 I love Kyary style and this PV is totally Kyary! Is so lovely and harajuku! I think I fell in love with Kyary and her style the first time I saw a street snap of her a year or more ago now, and now she’s really getting pretty big, huh?! The video is amazing, I love Sebastian’s set design, and whoever oversaw the general art direction in this, is wonderful! the video is certainly fascinating… fun, exciting, full of magic… is like being in a dream, the colors, the shapes, everything is great… I love this video, I’ve always believed that fashion and music are made for each other… great article! Wow, the eyes on her shorts and gloves remind me of Takashi Murakami’s art work! I think that girl would be a blast to hang out with. Pingback: MTV Dubs Kyary Pamyu Pamyu's PONPONPON "One of the craziest videos ever!" Yes, and there’s no coincidence in it. This MV is full of the same essence of Murakami’s Superflat artistic movement. God dammit Yasutaka why did you produce this LSD baby.